In THE JUKEBOX, we explore mental illnesses such as depression and anxiety and the people who have been tasked to bear those challenges. We dive into how they experience love, how they experience what is “supposed” to be the happiest day of their lives, how fine arts help serve as outlets, but most importantly how unconditional love from that special person is one of the greatest form of therapy. As part of the foundation of this shoot deals with mental illness such as depression and anxiety, we wanted to show the ways that sometimes people try to mask their issues. Whether it’s depression, anxiety, or just the common insecurities, we all have things that we are forced to deal with. It is very common for many of us to always put on a mask or facade that we’re okay or that things are beautiful, as the shoot progresses and the couple become more intimate with one another the mask is stripped away. By the end of the shoot we see our bride wearing that same mask as a crown of sorts, giving hope that through love we are able to turn our trials into triumph. The shoot also derives from Langston Hughes classic poem Jukebox Love Song, which was adapted for the location of the shoot. Shot in the legendary ballroom and concert hall, El Torreon we were fully aware of the music history that those walls contained and felt even more compelled to pay homage to that. Dance with you, my sweet brown Kansas City girl. With a color palette that consisted of various shades of green, burgundy, black, dark brown, caramel, deep purple, dusty blush, golden yellow, gold, silver, and copper we were able to create a heavy, yet ethereal atmosphere. So many details both great and small went into making this shoot spectacular; from a four-tiered multi-colored and multi-textured cake, to the breathtaking jewelry that adorns her neck and hands, a beautifully handwritten backdrop, to a FREAKING FLORAL MASK that also turns into an equally stunning floral crown. Let's not forget the classic all black tuxedo, the super gorgeous light blush dress that looked straight out of a fairy tale, or the hip hugging lace gown that just screams romantic. 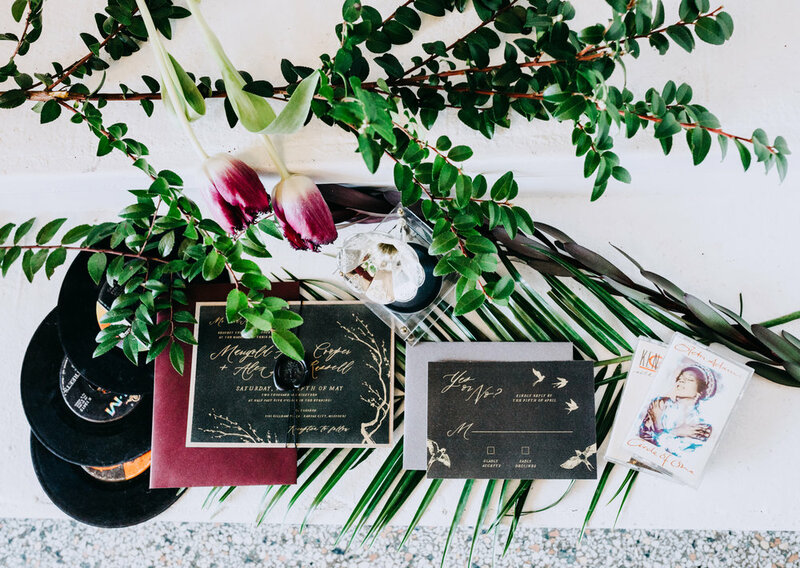 And where do I begin with the elegant and moody invitation suite paired with soul music on vinyl and cassettes? I am beyond proud of what we were able to accomplish with this shoot! That we were able to tell a story not only one of love, but of triumph as well. Everyone has a story. Every couple has a story. Every wedding should share that story. 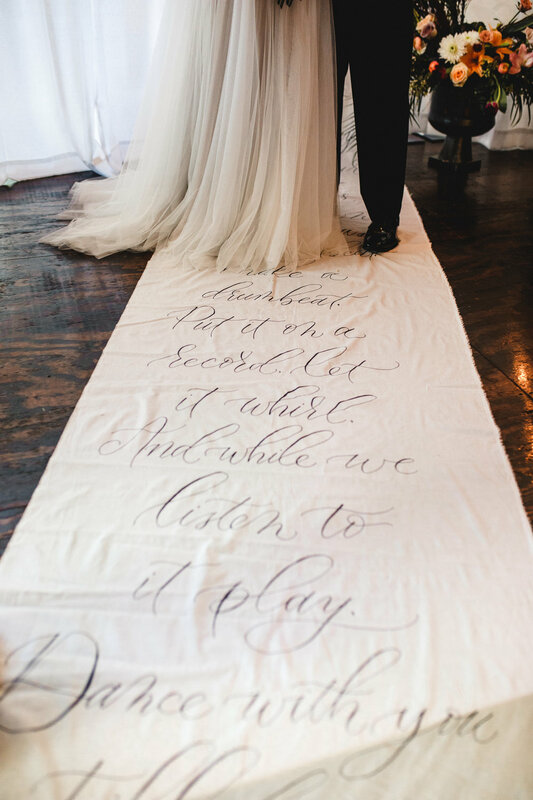 What story will your big day share? I want to give a special shout out to these vendors for trusting and supporting my vision! Also a special thanks to my wife, Iesha McIntosh, who has supported my vision from day one! Worth The Wait Studios owner, Alanzo McIntosh's debut styled shoot WE ARE YOUNG celebrates the ideology of millennials across the country; in diversity there is beauty and there is strength. Styling his first shoot in his professional career, Alanzo sought out to create visuals that showcase the different ways that a wedding can look and still be considered beautiful. I wanted to bring together some of the most creative minds in the Kansas City wedding industry and soak up all of their knowledge and their ideas for the shoot. A couple of the vendors I used I had previously used for my own wedding. As you can see I picked the right group of people, from the photographer to each model and everyone in-between who helped create magic were simply amazing! If you were to look at my Instagram feed or look at a lot the imagery put out in the wedding industry you would probably think that the only way to have a beautiful wedding is if it is rustic chic or you use a lot of pretty pastels. From the beginning of this shoot I had already made the conscious decision that I would break down the barriers that I feel keep so many couples from exploring other color palettes during their wedding. I essentially wanted to stay away from the traditional as much as I could with this shoot. Another way that we drifted from tradition was in using an Indian style table setting and seating. We used a custom table, which by the way was completed only hours from the start of the shoot -- special thanks to Bison Design Co. The details in the reclaimed wood and the color they were able to add to the table really helped bring the entire table setting together, mixing that with various pillows, warm throw blankets, poufs, and richly colored carpeting created a super cozy and relaxed bohemian look that can easily be used in any season. Overall, I am super proud of what we were able to accomplish within this shoot, I think we were able to not only create a super gorgeous wedding setup but also the fact that we were able to use our platform to celebrate things like young black love, which often times feels underrepresented in our society. For celebrating color, pastels are pretty for sure but God has given us an entire spectrum of colors--it's okay to use them! And for celebrating uniqueness, events like our weddings should always reflect ourselves. Although the overall aesthetic of a wedding can be important, any wedding vendor will tell you that it's the little personal details that always standout and highlight an event. Thanks for reading the story behind our first styled shoot WE ARE YOUNG, now let Worth The Wait Studios help tell your story. To view the full shoot please click the 'View' button below! I am so honored to have worked with all of the vendors listed below, they are all so talented and kind. I am proud to call them my mentors, and most importantly my friends. Also a special thank you to my wife Iesha, for all of the support!